A boy was grabbed by a transient on Swarthmore on Wednesday morning shortly after a father and his son left Robeks Fresh Juices and Smoothies. The father turned around, saw the transient holding the kid by the shoulders and pushed the transient off. 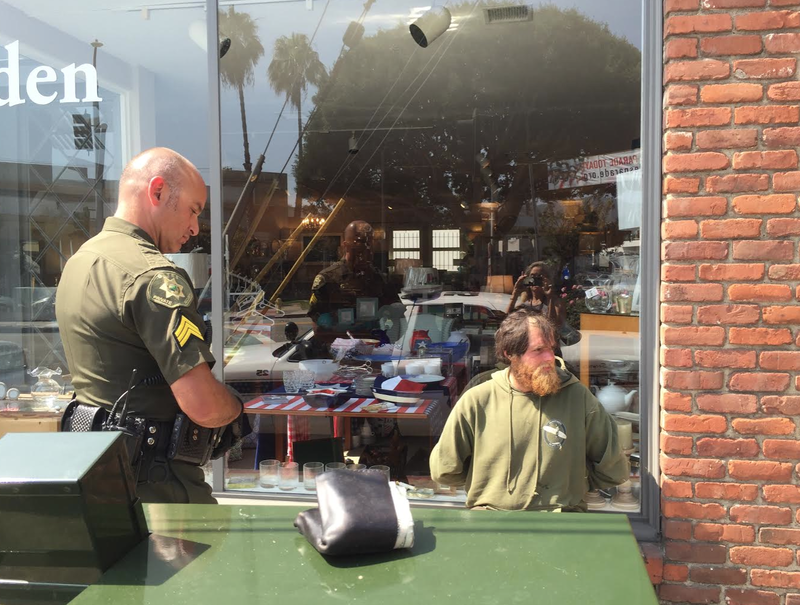 Parks instantly called Palisades Patrol, who found the transient over by the Village Green and detained him in front of Noah’s Bagels until police arrived. Since the police did not observe the activity, they are not allowed to detain an alleged assailant on a misdemeanor. LAPD’s Randy Redican, who was recently assigned to a transient detail in Pacific Palisade said that this was a private person arrest because the father agreed to the arrest and would press charges. There were no outstanding warrants on the man that has been seen frequently outside Noah’s, The Coffee Bean & Tea Leaf and Robeks for the past two months. Clerks at Carolyn’s and Noah’s said the transient would wait outside stores leaning on cars by the parking meters. Franco Gomez, who has managed Robeks for the past six years, said “I’ve seen him arrested before in front of Noah’s. I saw him early this morning [outside my store] and I asked him to move across the street.” But the transient ignored the request. “I’m worried about him being there because moms send kids into the store by themselves,” Gomez said. The transient will be booked today (June 29) and bail will be set. “He could be in front of a judge tomorrow,” Redican said, noting most likely he’ll be reprimanded to custody for a preliminary hearing. A correction was made to the original post to amend a misidentified business, Robeks Juice. Palisades News apologizes for the error.